History: (Namor I#45) - Walter Newell (Stingray) approached Namor with the idea of rebuilding Dr. Dorcas's research station into an undersea environment where both Atlanteans and humans could live in peace. He believed it could be successful with effort from both races and funding from Oracle, Namor's company. 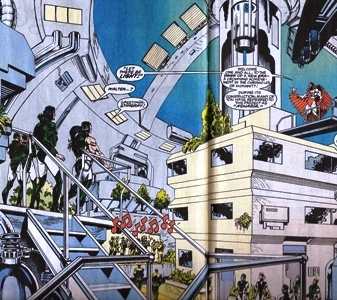 Newell showed Namor the plans he'd developed, and stated that he and Diane would be interested in living there. 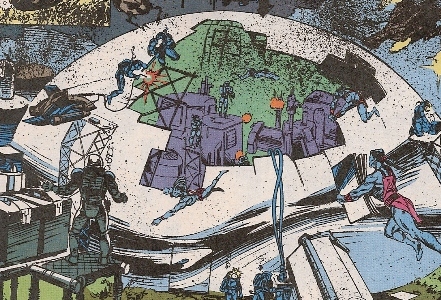 Namor returned later, suggesting they rebuild Hydro-Base according to Walt's plans. (Namor I#46 (fb)) - Using Oracle's funds, Hydro-Base was salvaged from the ocean's bottom and converted into a floating instrument platform. Newell contacted the United States Navy, looking for an additional funding source, and Lt. Langstrom was assigned to help oversee the deployment of Navy resources. Construction of the undersea dome and city, initially going by the name Aquaria, began. Cost estimates were upwards of two billion dollars and a timeframe of several months was put into place. In the meantime, an undersea habitat was built for the humans to live in, costing one hundred thousand dollars an hour to maintain. Humans were equipped with pressurizers and an exotic gas atmosphere to help them survive, given special jackets to regulate their heat, and 'talkers' to regulate their voice levels. Several humans and Atlanteans were recruited to help in Aquaria's construction, including Carrie Alexander, and many of the humans moved in to the subsea habitat. (Namor I#46) - The remains of Hydro-Base were stood on their end, giving direct access to the ocean's surface. Namor soon joined them at the undersea habitat. (Namor Annual I#4) - While workers concentrated on the construction, they found themselves attacked by Plodex monsters that devoured human and Atlantean alike. 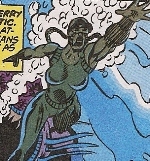 Stingray was unable to defend them because his exo-skeleton was damaged, so he sounded the alarm and Namor fought the creatures off, narrowly rescuing Kerry Reese, one of the workers. (Namor I#47) - Namor and his allies regrouped at Aquaria, tracking their enemies from there. (Namor I#49) - Namor returned to Aquaria. Andromeda and a contingent of Skarkan barbarians came to join the population there in their efforts. (Namor I#50) - Seeking funding for Oracle, Walter began taking bids for mining rights to the undersea city. While meeting with investor Jack Gamelin, Namor interrupted and asked Walter to wait until business at Oracle straightened out. Namor viewed Aquaria still being constructed and the dome becoming close to finished. (Doctor Strange III#64) - Doctor Strange contacted Namor mystically. Langstrom saw Namor speaking to himself and thought he was hallucinating. He spoke to Winston. Meanwhile Strange (a split-off of Doctor Strange) took the coral crab, unleashing a primordial serpent. (Doctor Strange III#65) - Salomé siphoned the energy from the fear of Aquaria to aid Namor against Strange, but Namor recovered the coral crab and left the battle. (Namor I#54) - Roxxon grew involved in the city's construction against Namor's wishes. When Namor returned to Hydropolis and saw a Roxxon set-up there, he angrily confronted Diane and Carrie. Namor moved to destroy Roxxon's involvement until Diane, dressed as Stingray, convinced him not to. (Namor I#55) - Namor led Carrie, Langstrom, and Diane into the finished city, where Walter christened the city Hydropolis, considering that a more appropriate name than Aquaria as that name had connotations to aquariums. The finished city contained a 'biosphere [that was] actually a sealed ecosystem, covering over six acres to support life for air-breathing species beneath the waves.' The city's inhabitants celebrated. (Namor I#56) - Carrie took Namor on a guided tour of Hydropolis. She explained, 'the biosphere is composed of porous, thermal gas, able to maximize heat from the weak sunlight penetrating the ocean's depths. But most of our energy is gathered from geothermal vents and tidal generators. The domed city is a sealed ecosystem... containing over 500 species of plants, animals, and insects. And it's capable of sustaining 6000 people!' Carrie also showed him the tropical biome, one of many rooms that was set up to mimic a particular environment from earth. In the tropical biome, a germicidal spray was admitted to each person who entered and contained a tropical paradise lifted right from the Florida Everglades, with animal life, artificial rain, and a waterfall. (Namor I#57) - Namor brought Phoebe Marrs to Hydropolis by being lowered from the sea-level port of Hydro-base. For allegations that Namor was involved in a surface world attack, Langstrom, Roberts, and Captain America tried to arrest Namor, but Namor escaped. (Namor I#58) - Langstrom and his allies returned from diving after Namor, and some of Namor's allies departed to help find him. (Fantastic Four Unlimited I#11/2 (fb) - BTS) - As a tidal waves ravaged the northeastern seaboard, the people of Hydropolis did their best to dissipate the waves. As one wave destroyed the surface section of Hydrobase, Diane rushed to the surface to save who she could. (Fantastic Four Unlimited I#11/2) - Stingray used a vibranium gun to dissipate the wave, stopped the falling tower from crushing Hydropolis, and found Diane alive. Comments: Created by Glenn Herdling, Geoff Isherwood and Mike Rockwitz. Hydropolis is still out there and presumably still populated! While some characters, including Stingray and Andromeda, have been seen since, many others have not. or to anyone or anything else with a similar name, including those with Aqua- or Hydro- prefixes. (Namor I#50) - Seeking to achieve the mining rights of the undersea city of Hydropolis for his company, Jack Gamelin met with Walter Newell at Hydrobase. Just as they were closing the deal, Namor arrived. Gamelin tried to introduce himself, but Namor ignored him and told Walter to hold out on the deal. After Namor left, Gamelin told Walter that unless something was done about Namor their deal was off. (Namor I#54) - Jack Gamelin saw that Roxxon grew involved with Hydropolis's construction despite Namor's objections. He made a deal with Phoebe Marrs to purchase a salvaged mound of Antarctic vibranium. (Namor I#3) - Rikki and Miss Simpkins were attending a Roxxon board meeting when Namor burst through the window on the back of the Griffin, accusing Roxxon in having a hand in an attack by Roxxon on his company. He left the Griffin there to contend with the Roxxon employees, then flew away. (Namor I#54) - Riki and Miss Simpkins were part of the Roxxon crew assigned to help in Hydropolis's development. 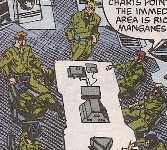 As they sat in a meeting to discuss their plans, Namor intruded and began destroying things until Diane Arliss, dressed as Stingray, distracted him. Namor battled Diane briefly, and she talked sense into him. (Dark reign Files I#1) - Myrna Simpkins is included in a list of Roxxon vice presidents. (Namor Annual I#4) - Oceanographer Kerry Reese moved to Aquaria (later Hydropolis) with no belief that humans and Atlanteans would be able to work together. While working on the construction of the city, Plodex monsters attacked and Kerry was barely saved from death by Namor.